This is the twentieth post of our series of projects to make us thankful for DIY. Be sure to check back everyday during the month of November for new simple and easy DIY projects. If you're like us, we only have so much space available in our outdoor shed. The shed has to hold a lot of things, including gardening tools and the lawnmower. You tend to keep reshuffling everything in order to make them fit. And, sometimes you get frustrated and start pitching stuff. So when the wife told me that we needed additional outdoor party tables I had no idea where we were going to store them, unless we just stacked them up somewhere, like on our covered patio. That's not good news for the patio. Turning it into a storage unit, I mean. 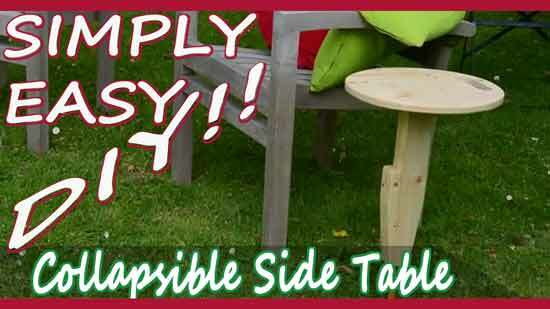 She said she had found some great picnic style outdoor tables that were collapsible. I guess I can add this to my "honey doo-list". Just between you and me I think she was dreaming of going camping again...shhh! Whether camping or partying at home, these fold-able side tables from Houtje can be stuck into the ground and moved around as needed. To ensure that your food and drink don't fall off, add a strong magnet or pin to lock the table firmly in place when it's in use. I hope you enjoyed today's featured project and don't forget to stop by "Houtje Boom - Be Creative" YouTube channel to check out even more great crafting and woodworking videos from her. Don't forget to subscribe.